Chinese model Liu Wen burst onto the scene in 2008 when she signed on with Marilyn and moved to New York. For her first season, she walked for 70 shows back to back, making her one of the most coveted Chinese models. She was the first one that I noticed after Du Juan stopped modeling so much in the international fashion circuit. I love her simply for smile, which creates deep dimples on both sides of her cheeks. She is also very affable and down to earth - I saw her exiting the Stephane Rolland show during Paris Haute Couture week this July, and despite being a rush, she was still kind enough to stop for photos and gave her smile to all the photographers. You get the impression that she's your girl-next-door instead of some of the other models that will huddle in a group while waiting for their ride to the next show. Aside from her infectious smile and amazing personality, she has great style as well, preferring vintage over the latest runway looks. 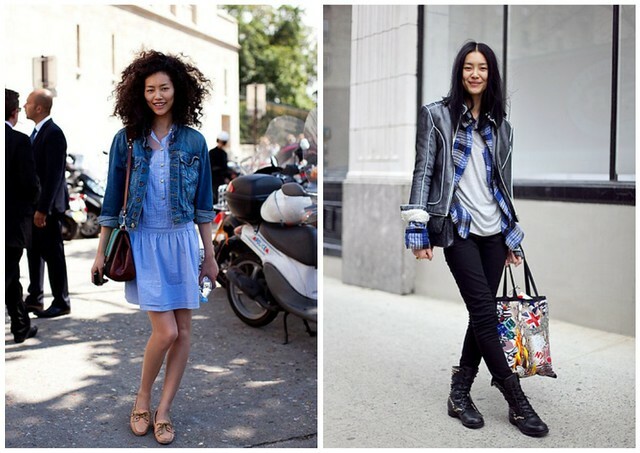 Liu Wen is rather tomboyish, as she prefers vintage leather jackets, denim and combat boots, but she has her quirky, eclectic side as well that makes her the versatile style icon. In her 4 off-duty looks above, she paired her denim jacket differently - once with a sweet shirtdress and once with an eclectic pleated skirt that took centerstage of her outfit. The leather jacket (though of a different style) was styled very differently as well - I especially liked how she wore her amazing vintage maxi skirt and then going simple on the top with just a plain white bell sleeved blouse and a leather jacket. The whole look is very fresh and ingenuious. 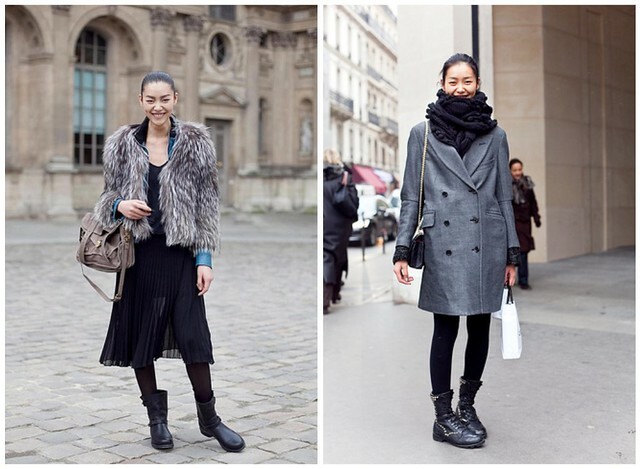 Liu Wen's looks during winter are equally effortlessly stylish. I especially like how she paired her fur jacket with a sportswear hoodie and baggy chambray jeans - it looks extremely street but high fashion at the same time. The last row of photos, she's seen wearing daring leopard print tights - another unexpected twist in her whole look which would otherwise look boring with the usual blazer-tanktop pairing. 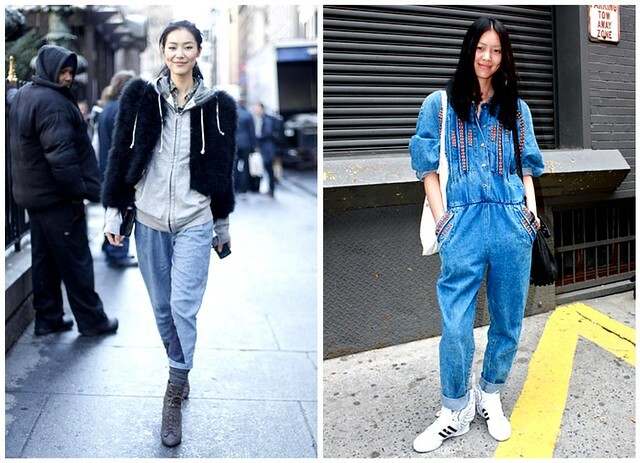 Second row, right: Her love for denim, street and tomboyish outfits take centerstage with this look. In a full length studded denim jumpsuit with those winged Adidas shoes and A. Wang studded bucket bag, she looks extremely laidback but still really stylish. 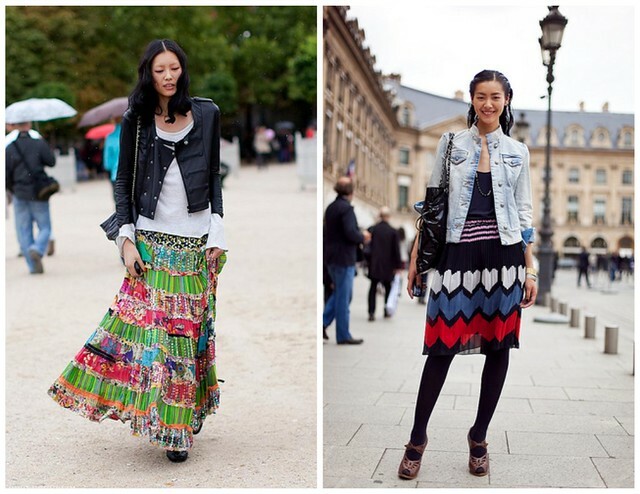 Leather jackets can go with anything too, even boho maxi vintage skirts. Don't be afraid to try denim in other forms more than jeans and miniskirts. Get a denim chambray shirt, boyfriend jeans, structured denim jacket, jumpsuit...the options are endless. Be surprising in your choice of pairing certain things together. The clothes don't always have to go together in terms of colour or 'style'. Eg. a pleated chiffon skirt doesn't always have to go with a sweetheart/babydoll blouse. A clash creates an element of surprise and refreshes the eye. In general, I like what I see.